RealRanchers.com featured the 2014 Laramie Peak CattleWomen Ag Expo writeup we sent them. This was my first year organizing this event after more than a decade of Chugwater rancher Judy West orchestrating the event. A great day and fun had by all! Thank you to Donita Graves, Laramie Peak CattleWomen for your contribution! It was recognized years ago that generations of young people were moving further away from their roots in agriculture. No longer was their awareness of where the basic components of daily life had their origin. As a result, the Wyoming CattleWomen organized an outreach program, called Ag Expos, that teamed up with various local businesses and agencies to offer a fun, hands-on day for third and fourth graders across the state. The Laramie Peak CattleWomen (LPCW) got involved in hosting their own each fall. 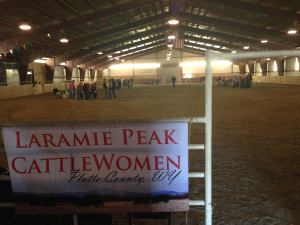 The 2014 Laramie Peak CattleWomen Ag Expo was hosted by Top Hat Arena in Wheatland. About 175 elementary students attended the event.